Wait No More Cause The Most Multi-Purpose Bicycle Rack Rear Bag Has Just Been Released! Are you sick and tired of poorly made bike bags that lose shape and are useless after a while? Do love bike rides but you worry about low night visibility? Do you need a portable bag that can be multi-functional and serve its purpose to the fullest no matter what you are doing? If the answer to those questions is yes, then you should keep on reading because we have the ultimate road bike gear waiting for you! Stop worrying every time you want to enjoy a night riding adventure with your children from now on, with our reflective rack fitting bag. Unlike other back saddle bags, our bag has reflectors on all 3 sides so as to make your rides safer and you happier! Plus, the piping around the whole bag will allow the bag to keep its good structure without losing in style and size! It has a strap for the back light as well. This mountain bike saddle bag has a main large capacity compartment to fit inside anything that you might need from small workout towels, lunch, sunglasses, to your wallet, notebooks or magazines. The side bottle pocket has a resilient drawstring that will prevent your energy drink or coffee tumbler from falling. Hassle free installation and removal thanks to its resilient Velcro straps. Remove it from your bike, carry it either as a tote travel bag or a messenger tool bag through its single shoulder strap. What are you waiting for? Get yours today and one as a gift to your biking buddy! MULTI FUNCTIONAL BICYCLE GEAR BAG: If you are looking for the most multi-functional and easy to carry around travel bag, then we got you covered. This bicycle saddle bag is designed to satisfy even the most demanding biking needs to the fullest and will certainly become your favorite on the road companion no matter where you are going either by bike or on foot! 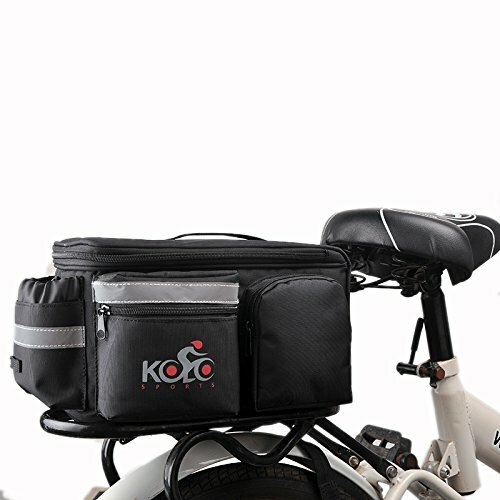 DURABLE NYLON & WATERPROOF CONSTRUCTION BIKE BAG: Kolo Sports has meticulously designed this portable bike bag from high quality Nylon fabric. Forget all those poorly made Polyester bags and trust our durable and water resistant bike trunk organizer. The bottom bears double cushioning padded foam so as to enhance the support and keep your belongings absolutely safe! ERGONOMIC DESIGN BICYCLE STORAGE BAG: Our pannier bag is made in such a way so as to be extremely ergonomic and comfortable to use. It is equipped with 2 zippered pockets to keep your most valuable stuff inside like iPhones, cameras or cash and credit cards. The strong Velcro will keep the bag where it belongs and the spacious interior compartment will hold anything that comes in mind. The side water bottle case has an elastic drawstring that will secure your bottles in place. BICYCLE REAR RACK BAG FOR VERSATILE USAGE: This bag can be used not only when you are riding your bicycle but while walking, shopping or picnicking with your friends. Besides the durable Velcro straps that will securely attach it behind the saddle, this bicycle gear bag can be used as a tote bag from the top handlebar or as a messenger bag via its shoulder strap! It's simply all up to you! UNISEX BAG FOR VERSATILE USES IN A SLEEVE GIFT PACKAGE: Try today our unisex rear rack black bag which is suitable for both men and women and even children and make a thoughtful present to a friend. Take it along at beach excursions, hiking with friends, camping in the woods, picnicking in the park, field trips and to many other occasions. It comes in a nice sleeve packaging and is a wonderful gift idea for a dear friend or a beloved family member. If you have any questions about this product by Kolo Sports, contact us by completing and submitting the form below. If you are looking for a specif part number, please include it with your message.